Sometimes something as simple as a dip can make one's day! 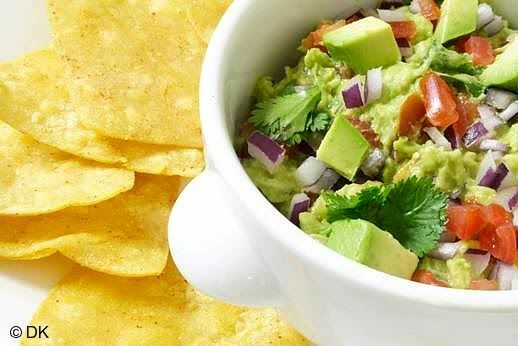 I mean I knew that some foods are special and always help to lift my spirits a bit, but never knew how much a humble Guacamole could do, to brighten my day, to bring back all my energy back with just few bites with corn chips. The other day, I had a lot of work to finish, few errands to run, bills to pay and by the time I finished all of it, by 4 in the evening I was exhausted! As I was moping around, I got a call from an acquaintance asking me whether she could drop by for that long pending tea!! Well I have to admit – if you come to my home unexpectedly – don’t be surprised – to be given only tea/coffee. I keep a poor snack pantry! No chocolates, No chips, No munchies, no coke/pepsi, No nothing! So imagine my chagrin when I realized that I dint have time to buy anything and suddenly I remembered corn tortillas I had – exactly 3 of them leftover. 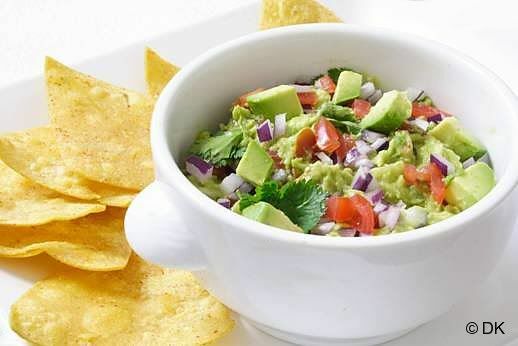 I always buy avocados which I consume at least once a week, thanks to the immense nutrition that it provides.Guacamole being such a simple dip with most of the ingredients always in my refrigerator, I thought of preparing this nutritious snack for her. Though the calories and fat in an avocado is quite high, these fats are actually mono saturated and thought to reduce blood cholesterol. 1. 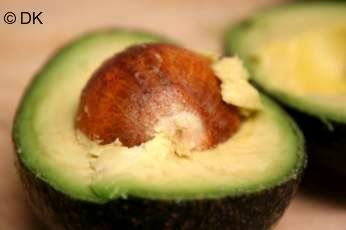 Cut 2 medium avocados(or 1) in half and discard the stone. Scrape the flesh from the halves and mash it roughly with a fork. 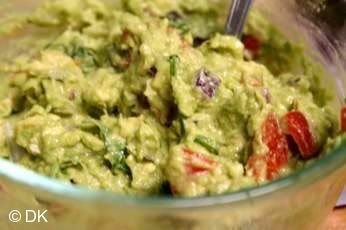 I like them chunky, but if you prefer smooth guacamole just blend them in a processor. 2. Add the onion,chilli,lime zest,juice,tomatoes and chillies. 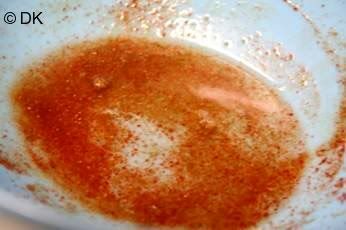 Stir and then add the cumin powder, pepper if needed and the olive oil. 4. 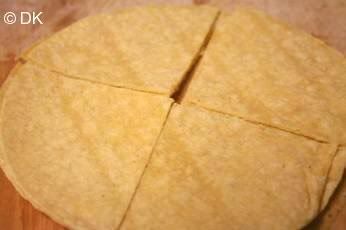 Cut then into Chip size pieces. 7. Place them side by side on a baking sheet. 8. 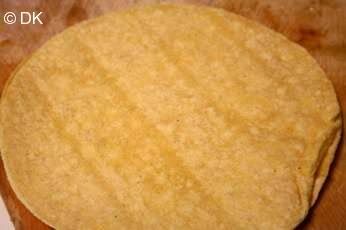 Bake them for 5-7 min in a 350 F oven or until lightly crisp. They get more crisp after cooling. 9. 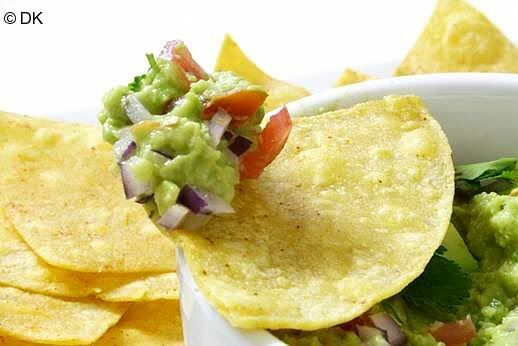 Serve the guacamole garnished with the cilantro and with stack of these Baked chips. Hey, I love the first pic esp the bowl in which Guacamole is served! and its one of my fav mexican dishes. :) I always have this as a side dish, which my favorite Gumbo! this looks like a great snack or appetizer! your pictures are great! I love guacamole too, an all time fave. 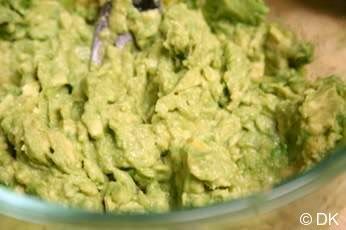 I am too lazy to bake chips, I wud rather buy a huge pack & make a bowl of guacamole. 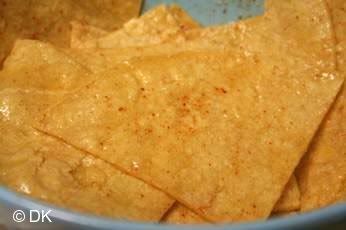 the pics look fab ..
ooooooh, your pics are so inviting, just want to grab some of these chips and guacamole!! Guacamole is in my to-do list.. Love the idea of baking the tortilla.. 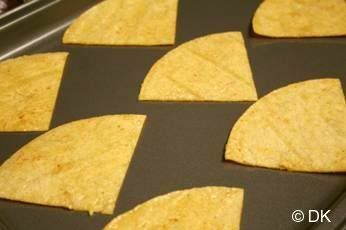 I really love the idea of making tortilla chips from tortilla and dip also looks yummy!!! Lovely pics...the guacamole and chips are rally tempting. Looks delicious. Pics are looking very fresh! 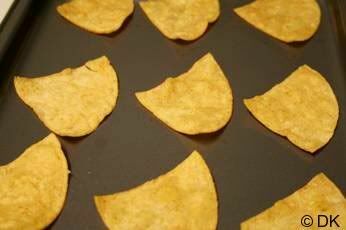 Chips looks crisp and the dip looks very refreshing!! Thats yummy and healthy..Could have that whole bowl.. I totally agree sometimes simple food are the best and comforting too. lovely! ur pics looks so good now, i know i say this in every post but really :D hehe..